McDonald’s and I have not been on the best of terms lately. First of all, I am attempting to lose weight, and walking into McDonald’s when you are dieting is like pulling the pin on a live grenade and stuffing it down your pants. In addition, I’m pissed off at McDonald’s over its “I’m lovin’ it” ad campaign. McDonald’s desperately needs to improve its sales numbers, and appealing to vacuous, hip-hop-addled teenagers is not the way to go about it. Teenagers don’t have any money. They order inexpensive items. Three teenage girls will share a single medium order of fries from the dollar menu. McDonald’s should be smart enough to realize that it owes its continued existence to people like me: fat guys with disposable income. But for a couple of weeks, twice a year, I find it in my heart to forgive McDonald’s for its transgressions. Because it’s not in my character to hold a grudge. Because I’m a reasonable guy. I don’t know what magical property it is that makes this sandwich irresistible. But Weight Watchers be damned, I will find a way to consume this sandwich even if it means eating nothing but celery the rest of the week. And if I really want to show will power, I will find a way to get out of McDonald’s after eating only one. 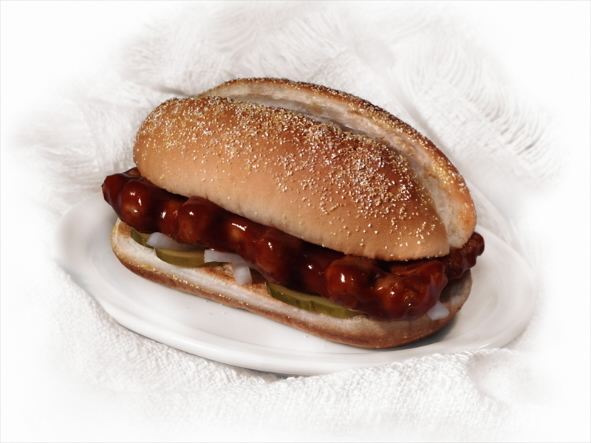 Ever notice how people are polarized on the McRib issue? You’re either totally grossed out by them, or you have to stop yourself from scarfing down three at a time. There’s no middle ground here. So anyway, I was running errands this morning and found myself driving toward a McDonald’s just before noon. There was no question about my course of action. The car practically turned by itself into the parking lot. Since I hadn’t planned this out in advance, I wound up stopping at the McDonald’s closest to the biggest high school in my town. Being here at the lunch hour on a weekday is a very bad idea. The place is beset with high school kids, trying to squeeze a quick lunch into their class schedules, so they come in waves roughly every half hour. The place was chaos when I walked in. Every table was occupied. At least thirty people were waiting in line. There were two working registers. The drive-through line snaked all the way around the building. I got in line and patiently waited my turn. The sign said they had McRibs. I wasn’t about to leave. The staff was struggling to keep up with the orders. One cheeseburger. Two hamburgers. Dozens of orders totaling less than two dollars. We were at the end of a class period, because the kids who were still in line were being harassed by their friends who had already eaten. “We gotta go! We’ll be late!” One boy finally had to give up on his order and leave empty-handed to get back across the street for his next class. As he and his friends ran out the door, his order finally came up. “Tree chaybooga!” shouts the counter person, waving the bag. English is not her first language. A guy in his thirties, still waiting to order but having watched the scene unfold, raises his hand and is handed the bag. He quickly dashes out of the store with his booty. By the time I finally reached the counter, the place was mostly empty of high schoolers. I got my precious McRib, filled my cup with diet soda, and went to find a seat. The place was trashed. Practically every open table was strewn with garbage. Carry out bags, sandwich wrappers, drink cups, French fry pouches, cups of ketchup, all left behind on the tables. None of the kids had bothered to take their trash to the bins. I found a clean table off in the corner and sat down to eat, muttering under my breath at the sorry state of parenting today. Self-involved jerks raising another selfish generation just like them. Kids have no concept of common courtesy anymore because their role models don’t either. Yes, I’m generalizing. It’s a specialty of mine. That and being hard on parents because I’m not one myself. It’s a lot easier to pass judgement that way. But wait. It gets better. I look out the window across the street toward the high school. The next wave is coming. Within five minutes, the McDonald’s is a madhouse again. Kids everywhere. A boy comes away from the counter with his lunch, and is confronted with the garbage-laden tables. No problem. He sits down and sweeps across the table with his arm, clearing a spot for himself, dumping the trash on the floor. And I’m gripping the table, stopping myself, because I want to confront this kid. Scold him. Ask him if he gets away with that at home. Did you ever know someone in high school who demonstrated strength of character? Someone who didn’t cave to peer pressure? Who wasn’t afraid to do the right thing? Do you remember what we called a person like that? When I was a kid, if a strange adult had reprimanded me for something, I’d have been mortified. An adult was automatically considered an authority figure. That’s not true anymore. I wasn’t this kid’s parent or teacher. I didn’t have anything over him. I wasn’t about to have some fourteen-old kid think that I was a dork. A big, grown-up, McRib-eating dork. Nonetheless, I can remember my high school days pretty well. We ate at fast food restaurants and we cleaned up after ourselves. It was automatic. We never thought not to. If we were feeling rebellious, we’d throw the trays into the trash, and run off giggling. You can’t do that anymore. They made the openings on the trash bins too narrow. Courtesy is nothing more than consideration of other people. That’s not automatic anymore. Our kids aren’t taught to be considerate of others, because it’s not a high priority for their parents. Why be a sucker and spend time thinking about the needs of others? They don’t care about you. I disposed of my trash, properly, and went to leave. There were so many kids waiting in line that my exit was hopelessly blocked. I’d have to go out the other door and walk around the front of the restaurant to get to my car. As I reached the door, two young girls from the high school were entering. The second girl stopped and held the door open for me. It was a reflex. Automatic. I made sure to thank her. It was such a little thing. But it made me feel so good just then.